Former U.S. Presidents and former U.S. first ladies Laura Bush, George W. Bush, Bill Clinton, Hillary Clinton, Barack Obama, Michelle Obama, and first lady Melania Trump pose with former U.S. President George H.W. Bush at the funeral of Barbara Bush in Houston. George H.W. Bush, the 41st president of the United States, a man born of patrician pedigree, but with a sense of honor, duty and service to his country that played out over the last 60 years of the 20th century, has died at his home in Houston, Texas. A family spokesman made the announcement late Friday. The former president was 94 and had been in poor health for several years, suffering from a form of Parkinson’s disease and other ailments. In a life on the world stage and at the highest levels of the American political scene, Bush lost and won elections before becoming the American leader in 1989, and then, with a declining U.S. economy and unemployment rising, was turned out of office after four years in the White House, losing his re-election bid in 1992. His pronouncement soon proved prophetic, with the fall of the Berlin Wall and the collapse of the Soviet Union occurring early in his presidency. Bush met with Soviet leader Mikhail Gorbachev shortly after the fall of the Berlin Wall, their Malta talks viewed as an important stepping stone toward the two leaders signing the 1991 Strategic Arms Reduction Treaty. 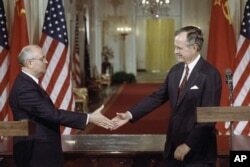 Soviet President Mikhail Gorbachev, left, and President George H. Bush shake hands following the signing of accords at the White House in Washington on Friday, June 1, 1990. During his four years in the White House, Bush ordered a military operation in Panama to overthrow its drug-trafficking leader, Manuel Noriega. Later, he sent troops to the Mideast to repel Iraqi dictator Saddam Hussein in his attempted takeover of oil-rich Kuwait. It was perhaps the high point of Bush’s presidency, his approval rating among U.S. voters reaching a record 89 percent, with a fireworks display lighting the night-time sky over Washington to salute the successful mission. Upon later reflection, Bush’s foray into Kuwait was considered as something less than a total victory in that many Iraqi troops were pushed back into their homeland, rather than captured or killed, and Hussein remained in power, only overthrown years later in the 2003 U.S. invasion ordered by Bush’s son, President George W. Bush. FILE - President-elect George H.W. 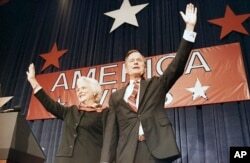 Bush, right, and his wife Barbara Bush, wave to the crowd at a victory celebration rally, Nov. 8, 1988, Houston, Texas. Bush’s commitment to his country came early in life. He was a naval fighter pilot in World War II, attacking Japanese targets at the age of 18, victorious in one of the war’s largest air battles, the Battle of the Philippine Sea. Later, he completed one mission after his plane was hit by flak, leaving his engine on fire. He bailed out of the aircraft and was rescued in the waters off the Bonin Islands. In his rise to the presidency, Bush held a variety of key positions over the years, often deemed by Republican presidents as the most qualified man in U.S. public life. He served as U.S. ambassador to the United Nations in the early 1970s, chairman of the Republican National Committee a short time later, then as chief U.S. envoy to China in the mid-1970s. Later, he was director of the Central Intelligence Agency. He was not always a successful politician, losing a 1964 election for a U.S. Senate seat from Texas, where he later founded an oil company. He won an election for a seat in the House of Representatives before losing another bid for a Senate seat. That loss set him on a path to the string of high-level appointments in the 1970s. 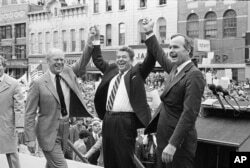 FILE - Former president Gerald Ford, left, lends his support to fellow Republican and presidential candidate Ronald Reagan and running mate George Bush, seen here on the final day of campaigning in Peoria, Ill., Nov. 3, 1980. Bush sought the 1980 Republican presidential nomination but lost it to then-California governor, Ronald Reagan, who tapped Bush as his vice presidential running mate in two successful national campaigns, in 1980 and again four years later. With Reagan barred by the U.S. Constitution from serving more than two terms, Bush plotted a presidential run for 1988, ultimately defeating the Democratic nominee, Massachusetts Gov. Michael Dukakis. The campaign was marked by an infamous political television ad produced by a group supporting Bush that depicted Dukakis as weak on crime because as governor he had released on weekend furlough a convicted killer, a black man named Willie Horton, who then raped a white woman and assaulted her white fiance. Some critics viewed the ad as racist and an attempt to play on white voters’ fears of crimes committed by menacing black men. FILE - Former Republican President George H.W. 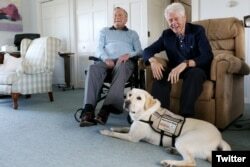 Bush, left, and former President Bill Clinton, visiting Bush, pose for a photo with Sully, a yellow Labrador retriever who'll be Bush's first service dog at his home in Kennebunkport, Maine, June 25, 2018. Four years later, however, Bush lost the presidency to Arkansas Gov. Bill Clinton, although the two later became friends, occasionally dispatched by subsequent U.S. presidents to oversee assistance efforts after natural disasters. 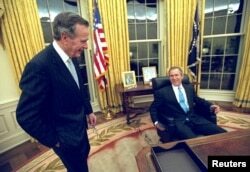 FILE - U.S. President George W. Bush sits at his desk in the Oval Office for the first time on Inaugural Day, in this January 20, 2001 file photo, as his father, former President George H.W. Bush looks on. In his retirement years, Bush watched as one of his sons, George W. Bush, twice won the presidency, only the second time in U.S. history that a father and son both became the U.S. leaders. Bush oversaw the opening of his presidential library in College Station, Texas, and was widely honored as an elder statesman. But on several occasions, as he was confined to a wheelchair while he battled a form of Parkinson’s disease, he had to apologize for inappropriately touching women who were standing next to him after telling a sexually suggestive joke. Bush was married for 73 years to the former Barbara Pierce, a woman he met in his teenage years. It was the longest marriage among any U.S. presidential couples. She died at 92 in April 2018.